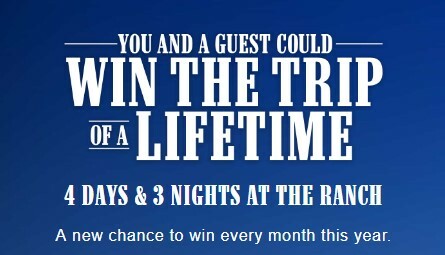 Marlboro Cigarettes are giving five lucky winners trips to the Marlboro Ranch! Enter each month to win the trip of a lifetime! FIVE PRIZES: Marlboro Ranch trip consisting of a 4-day/3-night trip for two (2) to a ranch in the western United States (the “Ranch”) in 2019 (location of Ranch and exact dates to be determined by Presenter at its sole discretion). Trip package includes round-trip, coach-class air transportation for two (2) from a major commercial airport near winner’s and travel companion’s residences (determined by Presenter in its sole discretion) to commercial airport near the Ranch; three (3) nights' accommodations at the Ranch determined by Presenter in its sole discretion (single room, double occupancy); ground transportation to and from destination airport; meals at the Ranch (menu determined by Presenter in its sole discretion); and a check for $600 made payable to the winner. Approximate Retail Value ("ARV") of each Grand Prize: $4,890. This Sweepstakes ends on 12/31/18 and you can ENTER MONTHLY to win.